FLEW OUT yesterday to Bengalaru and I was a Terminal Five virgin, because BA has finally switched practically all of its frights to the new big place at Heathrow. 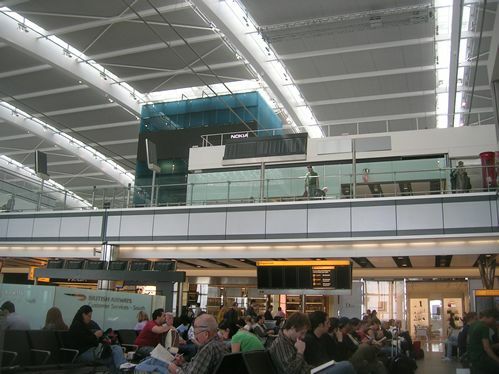 I was lucky enough to be in one of the lounges and they’re certainly massive enough – you have clear views of what look like carefully cultivated acres of dull grey stones, and above you are girders, girders and more girders. But there’s something about the place that makes you feel like you’re in a Jean-Paul Satre novel – I felt either half alive or half dead, and most of the other passengers looked that way too. And most of the staff for that matter. There’s something very very soulless about T5. That feeling is even more pronounced in the vast shopping mall that is T5. Endless rows of glossy shops less than half full, and such a feeling of space above that you’re reduced to what you are – an insignificant little bit of data being shoved at vast expense into silvery tubes and shipped out to points on the moral compass. And so after nine hours or so, we arrived at BIAL – you’ll recall that we were one of the first to fly out from the new Bangalore airport. Lobbed in at 4AM in the morning, we found immigration and everything else to be painless – despite large queues of people, we were all “processed” politely and swiftly so before a twitch of a lamb’s tail, we were facing the Louis Vuitton sculpture once again. This entry was posted in Uncategorized and tagged Bangalore, BIAL, British Airways, Terminal Five. Bookmark the permalink.